February 24, 2015 Jay Desko, Ph.D. If expectations aren't clear, sometimes it is really hard to know what your boss wants. But even if your leader is a great communicator, there are still some unspoken things that he/she expects from you. 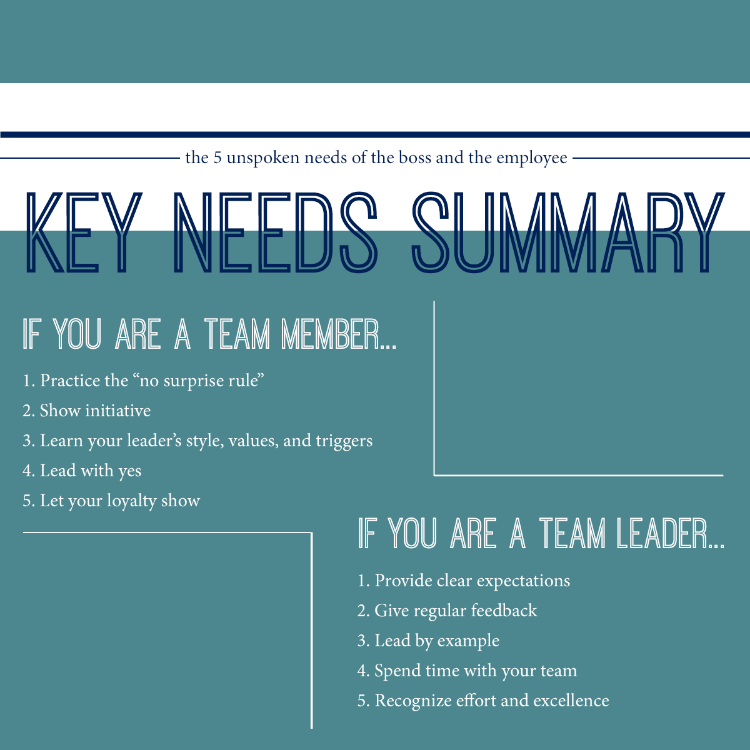 Here is our list of 5 things we believe every team leader needs from his/her team members. Sometimes surprises are fun, like a surprise party or gift. However, when it comes to your supervisor, he or she will not appreciate being surprised by learning, either second hand or after the fact, of problems, changes or other things related to you and your department. Unwanted surprises can cause a leader to be embarrassed, and embarrassment often results in defensiveness and negative reactions. Practice the “no surprise rule” by keeping your supervisor informed, especially with any item that can result in him or her being embarrassed or caught off guard. One way to show initiative is to identify and solve problems which will make the team look great and will advance the mission of the organization. Another way is to do more than is expected. 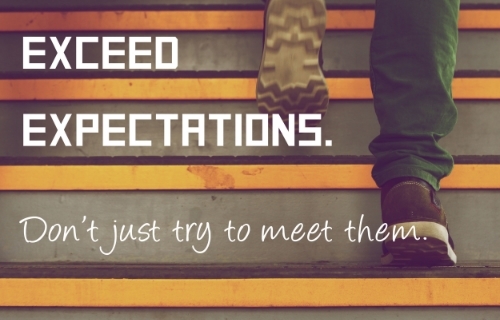 In other words, exceed expectations; don’t just try to meet them. Lastly, show relational initiative. Relationships require initiative from both parties; it is important that you take responsibility to pursue both your boss and peers. Good relational connection increases trust and relational capital, which you will very likely need at some point in the near future. Sometimes, team members are intimidated by those in higher positions. Don’t allow insecurity to hinder you. Stop into their office regularly for a quick hello. Inquire as to how they and their family are doing. Seek input from them for your own learning and growth. For any good relationship to survive long-term, you have to know what makes people tick. This includes your supervisor. Take the time to learn his or her work style. For example, does he manifest high work energy or low work energy? What are her values? For example, does she value . . . Timeliness? Relationships? Speed? Quality? And, what triggers him? For example . . . Being late? Failing to follow through? Sloppy dress? Grammatical mistakes? By taking responsibility for knowing the leadership style, values, and triggers of your team leader, you will be able to adapt and build greater synergy and credibility. “I don't have time.” “Yes, but.” “No.” These are three responses from team members that can bring steam to a leader’s head! It frustrates them as well as any member of the team who is a high performer. As leadership coaches, we often find ourselves advising team members to lead with “yes” rather than “no” or other deflecting excuses that lead to inaction or indecision. In one case, we provided feedback to a client that he was being viewed as the “yes, but” staff member, and he was losing the credibility of the leaders and team members around him because of it. He took this to heart and began to change his behavior by focusing on more proactive and positive responses to those around him, in others words, leading with “yes.” Within a few months, his supervisor shared that the transformation was amazing! Of course, we would never recommend leading with yes for inappropriate or unethical requests. That would not be smart! If you expect loyalty, show loyalty. Whereas water flows downwards, the natural flow of blame is often upwards! However, this seldom leads to team health or effective team performance. Showing loyalty does not mean that you should not shoot straight with those above you. On the contrary, it means if you have a concern or grievance, you need to be courageous enough to share it with your supervisor in an honest yet respectful manor. This can be a bit scary since you may be sharing something that he does not want to hear, especially since he holds your job in his hands. However, leaders need both feedback and confidence so they can trust you. Face to face and honest sharing can demonstrate loyalty, but gossiping about your leader with others or going around them to their supervisor can feel like a breach of loyalty. However, it is not appropriate to allow loyalty to the leader to supersede loyalty to the health and well-being of the organization. You must balance loyalty to the leader with loyalty to the mission and health of the organization. This is not always easy to do, but the effort is well worth it. Are you the boss or supervisor of a team? Check out our blog post on the 5 Things Your Employees Need from You.